In an effort to understand more about the lifespan of water infrastructure, Dr. Juneseok Lee, Associate Professor of Civil and Environmental Engineering & California Water Service Co. Chair Professor at San Jose State University, conducted research regarding water line failures and how pipe materials affect survival rates. 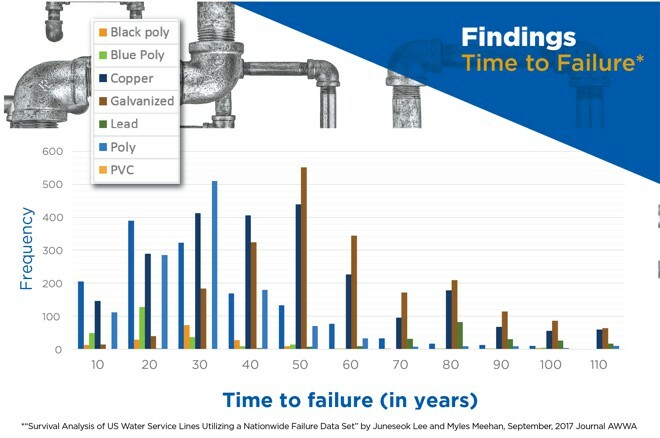 In the study, published in the Journal of the American Water Works Association, Dr. Lee used nearly ten years of national historical water line failure data from HomeServe, a home repair service plan provider*. In servicing over 1 million active water line service contracts and performing tens of thousands of repairs per year nationwide, HomeServe has amassed a significant body of data about the age, pipe material and lifespan of water service lines throughout the country. Ten years’ worth of data tell the proverbial cautionary tale: a significant percentage of U.S. housing stock is poised for potential service line failure. In this study, galvanized steel was the mostly widely encountered material in homes built in the 1950s and 1960s, and was still widely seen (second only to copper) in the 1970s. 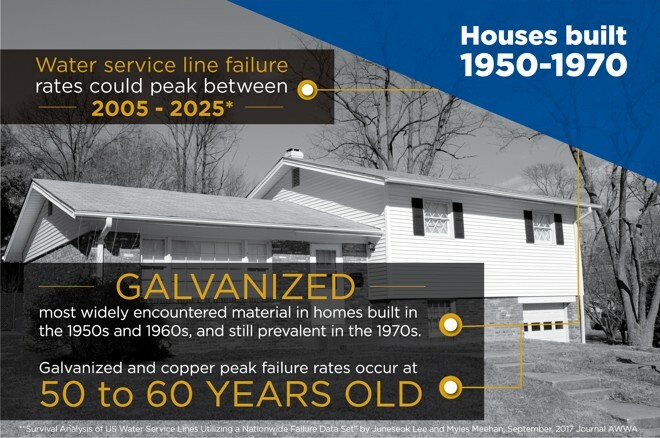 With galvanized and copper pipes demonstrating peak failure rates at between 50 and 60 years of age, the failure rates for these older homes would peak between 2005 and 2025. Newer homes, built with modern materials, are not expected to fare much better. 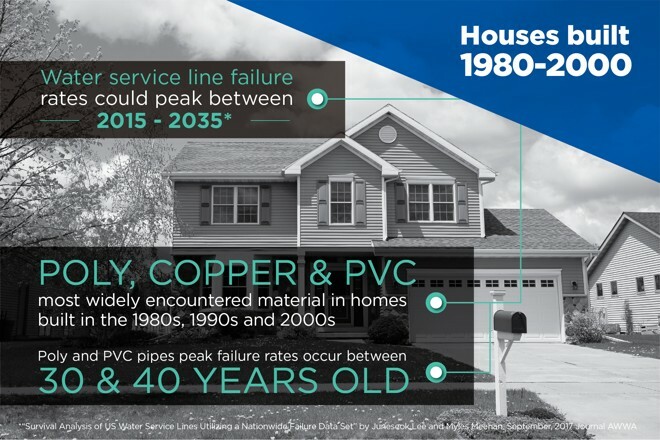 The study revealed that poly, copper and PVC were the most widely encountered material in homes built in the 1980s, 1990s and 2000s, with peak failure rates for these newer materials occurring between 30 and 40 years of age. That means expected failure rates for these newer homes would peak between 2015 and 2035. But the graphs only tell part of the story. For many residents, a water service line failure can present a tremendous financial hardship, putting pressure on already limited finances that are being juggled between housing, food and transportation costs. Replacing a water or sewer line could cost thousands, but one in three homeowners don’t have even $500 set aside for an emergency home repair, according to HomeServe’s Biannual State of the Home Survey. “We saw people at risk of having to leave their homes because of the financial hardship of having to pay for an expensive water-line repair,” said John Sharp, retired Kansas City, MO councilman. A water service line failure can present a tremendous financial hardship on homeowners, putting pressure on already limited finances that are being juggled between housing, food and transportation costs. As cities struggle to make badly needed upgrades to their public water infrastructure, there needs to be a plan to include investment in private-side infrastructure improvements. But wishes of “good luck” are what many residents are left with, as many cities across the U.S. either haven’t yet tackled major water infrastructure upgrades or have done so without a plan to assist residents with private side repair costs. The San Jose State research paper recommends water systems and municipalities educate their customers about their responsibilities with regard to service lines, providing customers with information that presents their options when faced with a service line failure. In addition, water utilities and municipalities should consider programs they can offer as a solution to help customers manage the cost and inconvenience of a failure when it occurs. The City of Erie, Pennsylvania is taking a proactive approach with a program to replace older and deficient private property sewer laterals. Many municipalities conduct smoke tests to detect inflow and infiltration (I&I) of groundwater and stormwater into their sewer systems, which can strain treatment resources and cost money. When leaks are discovered on a private line, the property owner can be confronted with an expensive, mandatory repair. Some cities offer assistance to residents who cannot afford these repairs, but this is a reactive effort. The Erie program requires developers of new projects that will add incremental sewage flow to reduce I&I by replacing older or deficient private laterals within that sewer district. A developer is given a specific number of laterals to replace, based on the size of their proposed project. The homeowner gets a free sewer line replacement and is only responsible for final restoration work and costs. The National League of Cities (NLC) Service Line Warranty Program, administered by Utility Service Partners, Inc., a HomeServe Company, is another proactive approach. The program helps municipalities address aging private infrastructure - offering homeowners an affordable protection plan through partnerships with cities. "A failing water or sewer service line can result in a financial disaster for a citizen and in extreme cases, result in loss of the home for families living paycheck to paycheck. The NLC Service Line Warranty Program proved a lifesaver in our town for many families." said Jim Hunt, long-time Mayor and Councilmember in Clarksburg, West Virginia and Past President of the National League of Cities and Advisor to the NLC Service Line Warranty Program. The NLC Service Line Warranty Program is a good example of a public-private partnership that requires no investment of municipal dollars and little in the way of municipal management. Collaborating with this NLC program enables municipalities to educate and protect homeowners without the extensive logistical and administrative challenges that can distract from their core missions. The program also provides non-tax revenue to fund important municipal initiatives. Many participating cities have implemented best practices that can serve as a model for the successful marriage of private and public efforts. For example, In the City of Phoenix, funding received through program participation benefits the City’s fire and police departments. In San Diego, proceeds are contributed to the general fund which covers essential city services like public safety, parks and libraries. What does the future hold for America’s water infrastructure and those who use it? * “Survival Analysis of US Water Service Lines Utilizing a Nationwide Failure Data Set” by Juneseok Lee and Myles Meehan, September, 2017 Journal AWWA. Independent research, data requested by researcher and provided free of charge by HomeServe.